I’ve switched my focus a little from women’s clothing to men’s, partially thanks to the variety of illuminations that I now have access to, and partially as I need to clothe my other half in better gear than the stuff I made him in our first years back in Australia. One of the items he will need for a turn of the 1500s ensemble is a pair of fitted hose to be tied to his doublet. This item of clothing was ubiquitous in the late 1400s, the jeans of the day. They were tightly fitted to the legs, and shaped the legs and buttocks to some extent. The hose were closed at the front with a codpiece which was padded to achieve a variety of fashionable shapes that shifted over the decades. I’ve tried to make these in one hit from hip to toe twice before and it’s just not worked, as there are so many stress lines and points of peculiarity in this item. This includes one occasion where I worked with a commercial pattern, and the bias twist lines still didn’t work for me. Instead, after making knee-high hose for myself I decided to split the hose into two parts initially to stress test how to make them, and then join both parts together into one item later. This article is about the upper stocks that I made as part one of this theory. The other part will be a pair of separate 14th century hose which I’ll be asking an experienced male costuming friend to help me with. The use of separate upper stocks in the last decade of the 1400s is conjectural. 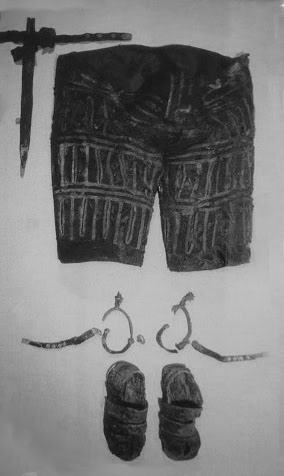 We have an extant pair of tight upper hose from Italy in the 1520s, and a set from Germany are shown in the Tudor Tailor. I also found an image of an item from the late 1490s that could be a man wearing separate upper and nether stocks over his hose, specifically the gentleman entering the door in the image at right. The separation of the lined section from the smooth section in the upper thigh, along with the turned-over and draped section on the calf, suggest to me that these could be two separate items. Pattern: Cut off version of the Tudor Tailor’s hose. Codpiece self drafted. Total cost: This was made from remnants in my stash, the brown wool was the same as that used for the dress in the Pink Challenge, and the linen edging was from my box of cabbage. Probably $20 all up.